Have you ever thought of visiting a place where the sea meets the hills, where ancient history is combined with modern art and there is also space for shopping and good food? Here, Pietrasanta is such a place. An ancient village nestled at the foot of the Apuan Alps, a place that was once a crossroads of illustrious people and today is a refuge for artists. Pietrasanta is a Tuscan town in the province of Lucca and has about 25,000 inhabitants. It is considered the historical capital of Versilia and rises on the slopes of a hill, the Colle di Sala. The name of the city derives from the Milanese nobleman Guiscardo Pietrasanta who, during his mandate as mayor of Lucca, founded it in 1255, during the struggles with the Ghibelline Republic of Pisa. Subsequently, the village was fortified with an imposing walls by Castruccio Castracani, lord of Lucca since 1316. A coveted city by Pisa, Genoa and Florence, Pietrasanta is located along the Via Francigena and has always been a border and transit area. 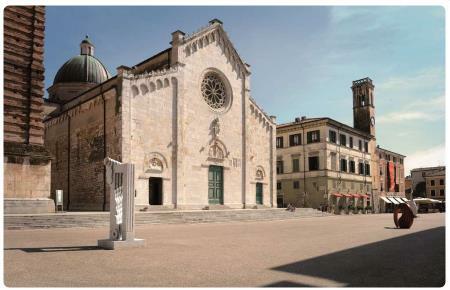 Read the history of Pietrasanta. One of the main features of Pietrasanta, like all of Versilia, is the link with marble processing. Of ancient origins, this work, during the nineteenth century began to be perfected, to "rise up", when the first artisan workshops were born that then in a short time, multiplied. 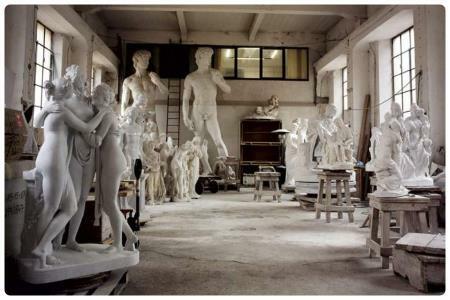 In 1843, in Pietrasanta, a real school was inaugurated, where the precious art of marble working was taught. Today it is the Stagio Stagi Institute of Art that carries on the tradition, transmitting the mastery of the past to hundreds of young people, who want to learn the best techniques, to transform a piece of marble into a work of art. Also worth seeing in Piazza del Duomo are the two buildings of Palazzo Moroni and Palazzo Pretorio, a civic office building. For lovers of sculpture, the Museum of Sketches (Museo dei Bozzetti) and the International Sculpture Park are not to be missed. Other interesting museums are the Archaeological Museum and the Barsanti Museum (dedicated to the internal combustion engine, invention of Eugenio Barsanti). Other local attractions are the Municipal Theatre, the Palla sculptor's workshop, the birthplace of nobel price Giosuè Carducci in Borgo di Valdicastello and going down towards the sea, Marina di Pietrasanta. Finally, the streets of the ancient Pietrasanta are also interesting, such as the characteristic Via del Riccetto with river cobblestones, or Via della Fontanella. Learn more about the individual attractions mentioned by reading what to see in Pietrasanta. In addition to visiting the Bozzetti Museum, walking through the city streets you can admire sculptures and works of contemporary painting, which have become precious furnishings in the city. 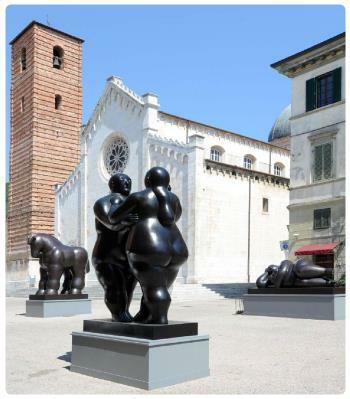 These include: Fernando Botero's Warrior in Piazza Matteotti; Harry Marinsky's San Francesco in front of the Church of St. Francis; Francesco Messina's Pugilatore in via Garibaldi; Igor Mitoraj's Centaur (artist who died in 2014) in Piazza Centauro. Among the paintings: frescoes by Fernando Botero with Paradise and Hell in the Church of Sant' Antonio in Via Mazzini; frescoes by Igor Miroraj with L'alba and Il Tramonto in the hall of the municipal council. A peculiarity of Pietrasanta is that visiting it is easy to come across the many artisan workshops, in which, yesterday as today, you create sculptures, mosaics, but also exceptional works of terracotta, clay, bronze, steel. To preserve and pass on the art of sculpting, Pietrasanta's artisans gathered together a great association called "Artigianart", with the aim of demonstrating how one can draw from a block of marble "emotion, form, sublime art". Pietrasanta is also an excellent destination for quality, original and creative shopping. If you only need to choose a place to shop, buy little and well in Daniela Del Cima's magnificent show-room (via Barsanti 40 at the time you write. Numerosi sono i personaggi famosi, che hanno legato il loro nome a Pietrasanta. In primis Giosuè Carducci, che nacque a Valdicastello, frazione di Pietrasanta, nel 1835. Qui il poeta trascorse la sua infanzia, ed ancora oggi, è possibile visitare la sua casa natale. Premio Nobel per la letteratura nel 1906, Pietrasanta lo ricorda ogni anno con il Premio Nazionale di Poesia a lui dedicato. Michelangelo Buonarroti, qui stipulò diversi contratti, per i marmi che hanno dato vita ad alcune delle sue opere di maggior prestigio. Anche Giambologna, l'Ammannati e il Vasari visitarono a lungo questi luoghi per il marmo bianco. Sapete poi chi fu l’inventore del motore a combustione interna? Un Italiano, un certo Padre Eugenio Barsanti, che nacque a Pietrasanta, al numero 77 di Via Mazzini, il 12 ottobre del 1821. Padre Eugenio riuscì a brevettare la sua invenzione in Inghilterra. Sono nati a Pietrasanta lo scultore Stagio Stagi (1479-1561), lo storico e scultore Vincenzo Santini (1807-1876). Hanno soggiornato a Pietrasanta, anche lungamente: il poeta Gabriele D’Annunzio, il celebre scultore polacco Igor Mitoraj (Mitoraj riposa nel cimitero di Pietrasanta) e il grande scultore colombiano Fernando Botero, Henry Moore, che ha lavorato molto in Versilia, l'italiano Cascella, Kan Yasuda, Thimer e molti altri. Oggi a Pietrasanta vive una comunità internazionale composta da oltre 400 artisti, che rendono Pietrasanta luogo d'incontro fecondo tra tradizione e tecnica antica e tecnologia e nuove tendenze dell'arte contemporanea. There are many famous people who have linked their name to Pietrasanta. First of all Giosuè Carducci, who was born in Valdicastello, a hamlet of Pietrasanta, in 1835. Here the poet spent his childhood here, and still today, you can visit his birthplace. Nobel Prize winner for literature in 1906, Pietrasanta commemorates him every year with the National Prize of Poetry dedicated to him. Michelangelo Buonarroti, here signed several contracts, for the marbles that gave rise to some of his most prestigious works. Giambologna, Ammannati and Vasari also visited these places for a long time due to the white marble. Do you know who invented the internal combustion engine? An Italian, a certain Father Eugenio Barsanti, who was born in Pietrasanta, at number 77 Via Mazzini, on October 12th 1821. Father Eugenio managed to patent his invention in England. The sculptor Stagio Stagi (1479-1561), historian and sculptor Vincenzo Santini (1807-1876) were both born in Pietrasanta. They have stayed in Pietrasanta, even for a long time: the poet Gabriele D' Annunzio, the famous Polish sculptor Igor Mitoraj (Mitoraj rests in the cemetery of Pietrasanta) and the great Colombian sculptor Fernando Botero, Henry Moore, who has worked a lot in Versilia, Pietro Cascella, Kan Yasuda, Ivan Thimerr and many others. 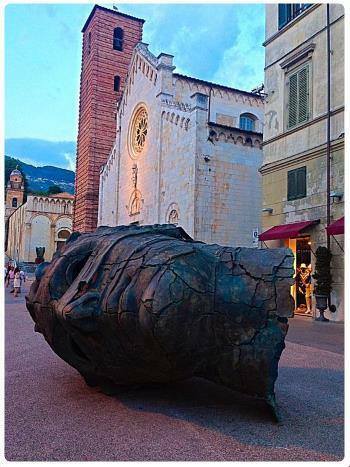 Today in Pietrasanta lives an international community made up of over 400 artists, which make the city a fertile meeting place between tradition and ancient technique and technology and new trends in contemporary art. Once you have visited the beauties of Pietrasanta, you can only enjoy the sea. The pleasant seaside resort of Marina di Pietrasanta, a few kilometres from the town, stretches for about five kilometres of beautiful Tyrrhenian coast. Famous and sought after since the early twentieth century, Marina di Pietrasanta is made up of four centres: Fiumetto, Tonfano, Motrone and Focette. The first resort takes its name from the Fiumetto ditch, which flows into the sea. It is characterized by a lush coastal forest, which is the public park of La Versiliana, home of the interesting Festival of the same name. There is the "romantic" eighteenth-century bridge, known as the "Prince's Bridge" built in honor of the Grand Duke of Tuscany Leopold I, which was used for the passage of soldiers on horseback surveillance along the beach. The town of Tonfano owes its name to the former Tonfalo river, which passed through it until the 1920s and had its mouth here; it is the richest centre in terms of trade and public services. The promenade and the promenade are embellished by a long pier, in the sea side 214 meters, inaugurated in 2008, excellent for a break with a look at the sea. In Motrone, on the other hand, there was a coastal fortification, destroyed at the beginning of the nineteenth century and an ancient and important port of call. The port is very old; it was active thanks to the Republic of Lucca, which wanted to bypass Pisa, did not want to pay duties, customs and leaps. When at the beginning of 1500 Florence conquered Lucca in via definitive, having already beat Pisa in 1400, lost interest in keeping in operation two ports, Motrone and Pisano, and then let the nature unsabbby Motrone. Finally, the locality of Focette, a marshy area for the numerous small "mouths", mouth from which derives its name. 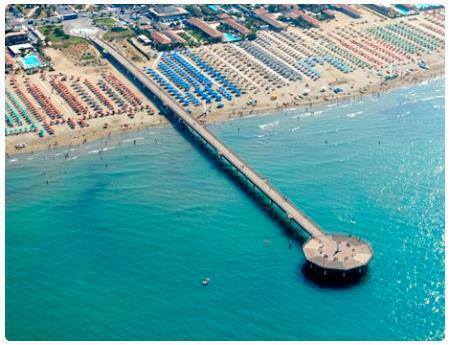 Focette was once the most exclusive and worldly seaside tourist resort of Versilia in the twentieth century. Here you will find La Bussola, which together with the Capannina di Forte dei Marmi, were the local-cult of Versilia nights, temples of Italian and foreign music of the fifties and sixties. Read on Marina di Pietrasanta.